10" x 5 3/4" (once trimed). and FOUR 3 1/2" for the 8 (what I call) background triangles. 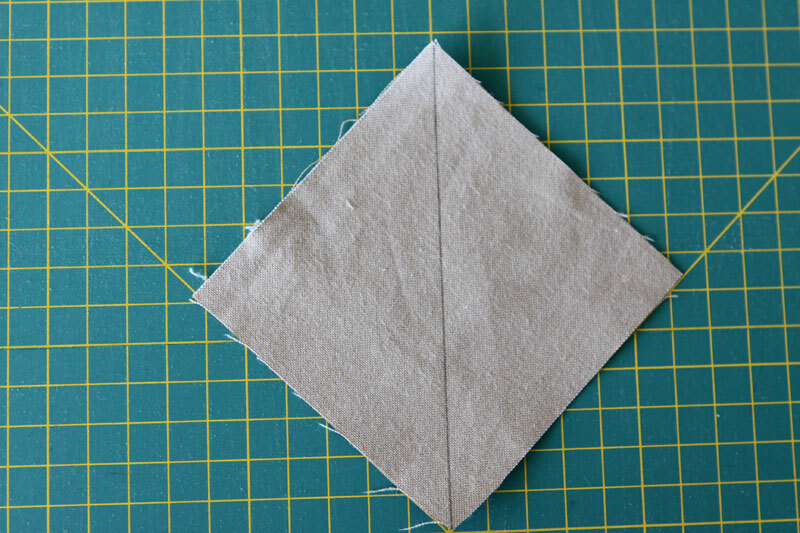 With a sharp pencil draw a diagonal line on the wrong side of each small square. 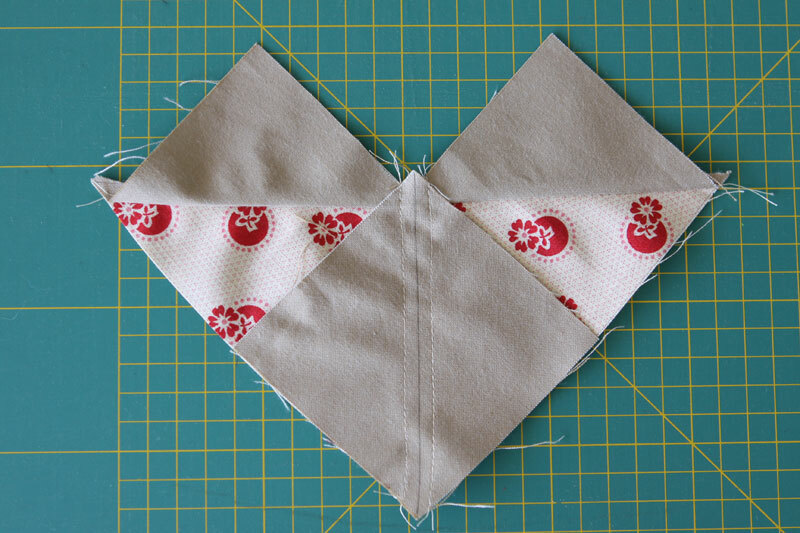 Place two small squares on the big square, right side against right side, as shown above. 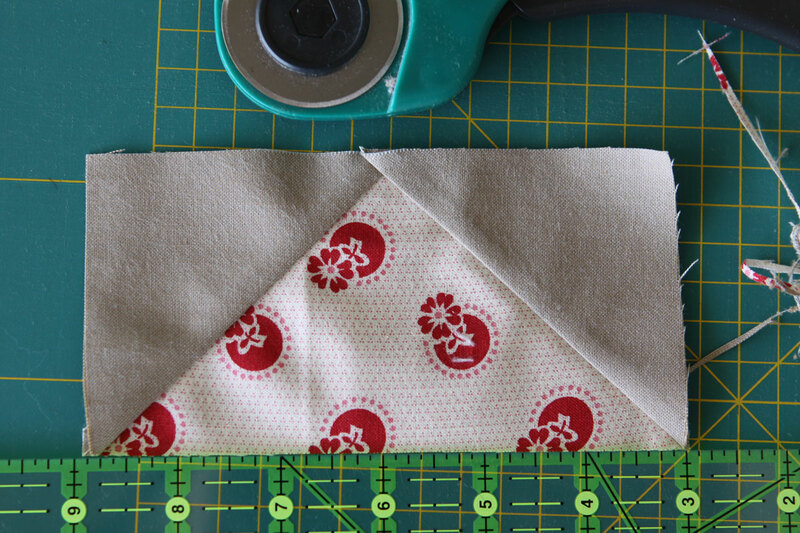 Sew along each side of the line, at 1/4". On each obtained piece place one square, right side against right side. 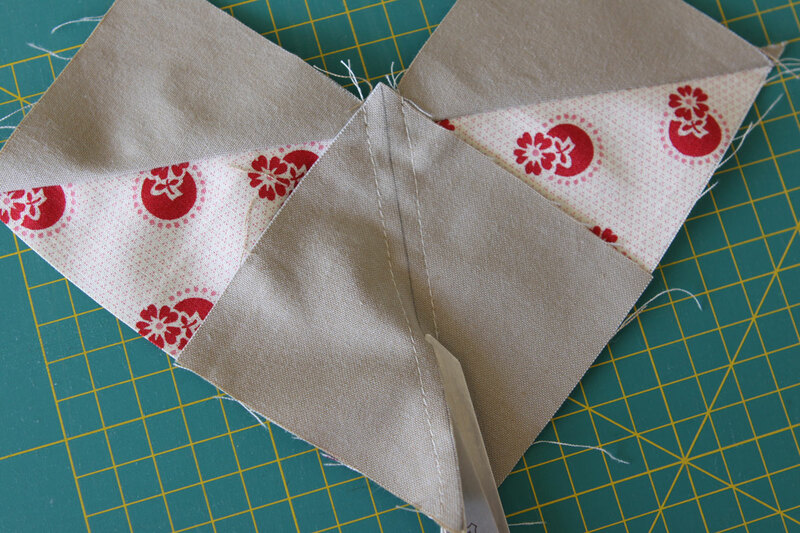 Again, sew at 1/4" on each side of the line and cut on the line. 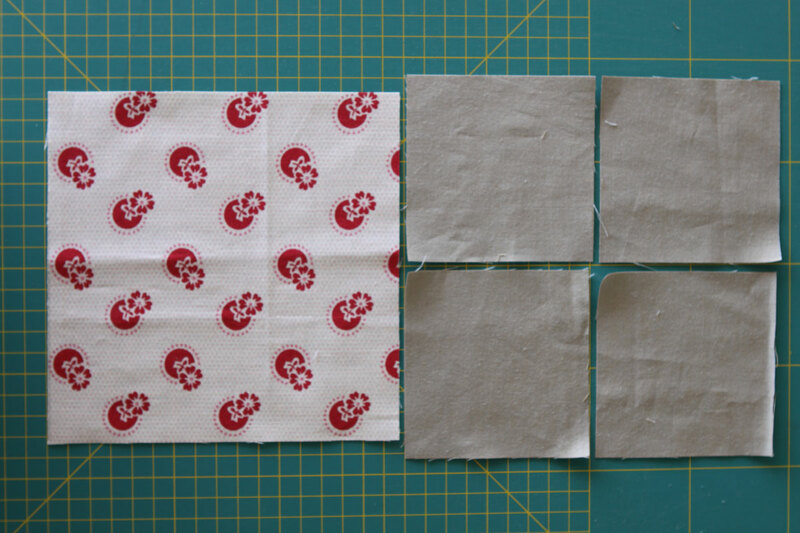 Doing so, you obtain four rectangles 5 3/4" x 3 1/8". Piece them together. Press without opening. 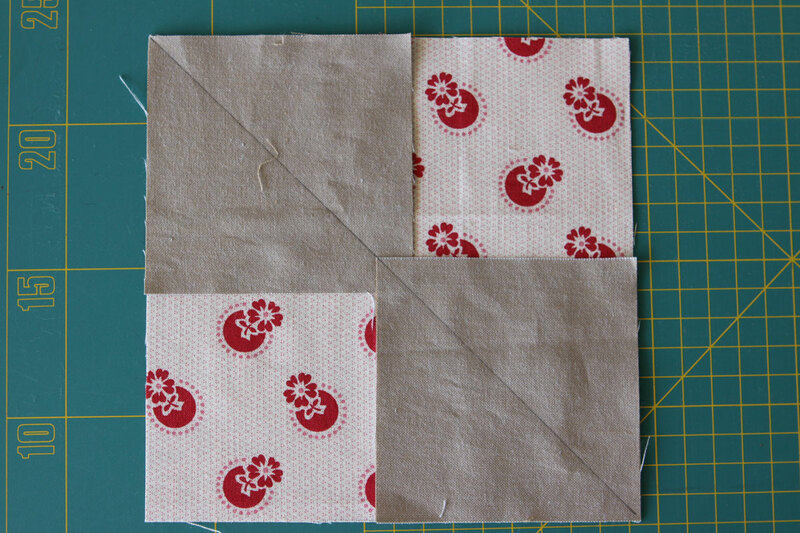 Then trim the four sides to get a perfect 10" x 5 3/4" rectangle. I always do my Flying Geese with this method. I think it is so simple. 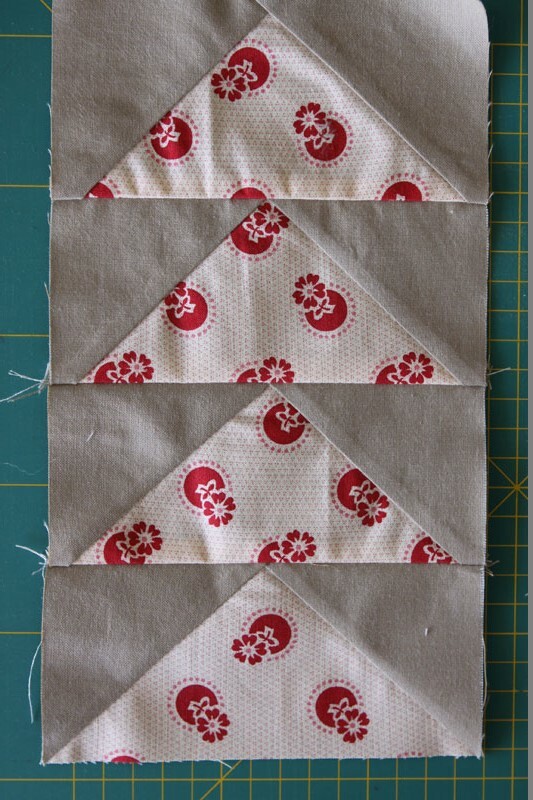 For the crumb quilt, I do the stars' points this way. 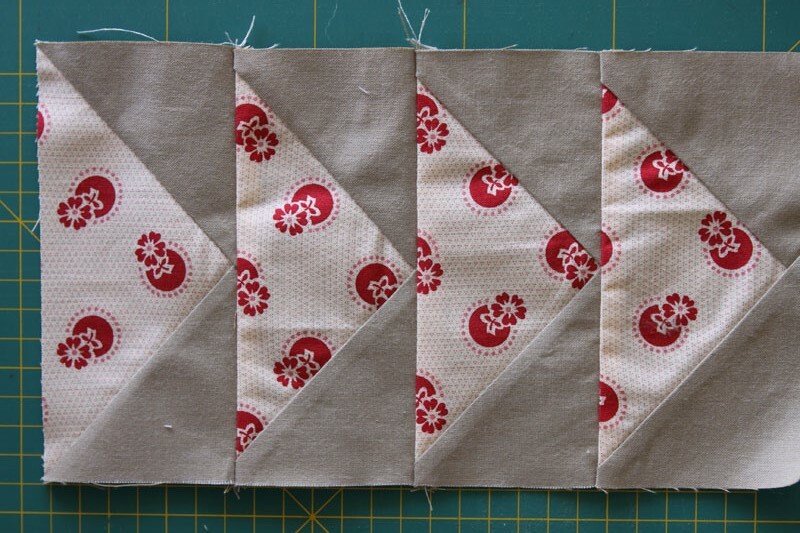 I cut the little squares from different fabric to get a different point and the geese is always white. It is so quick. I have seen this before but have not tried it. Thank you for an excellent tutorial! I love this method. I used to do the squares in the corners but this is way more accurate! 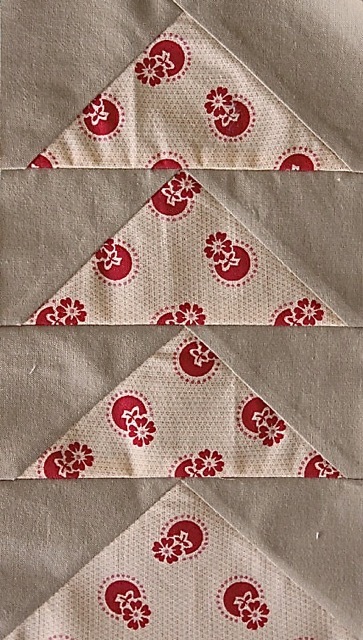 I shared this tutorial in my tulip quilt blog. I love this method. Thank you for sharing. What a neat method! I had to read through that twice to wrap my brain around it. Thanks for sharing the tutorial! This is my favorite way to make flying geese when I want 4 that are the same. So fast and accurate. Nice tutorial showing how its done. Thanks for the sharing this tutorial. New follower. Great tutorial, Christine! Thanks for sharing! Whoop whoop!! 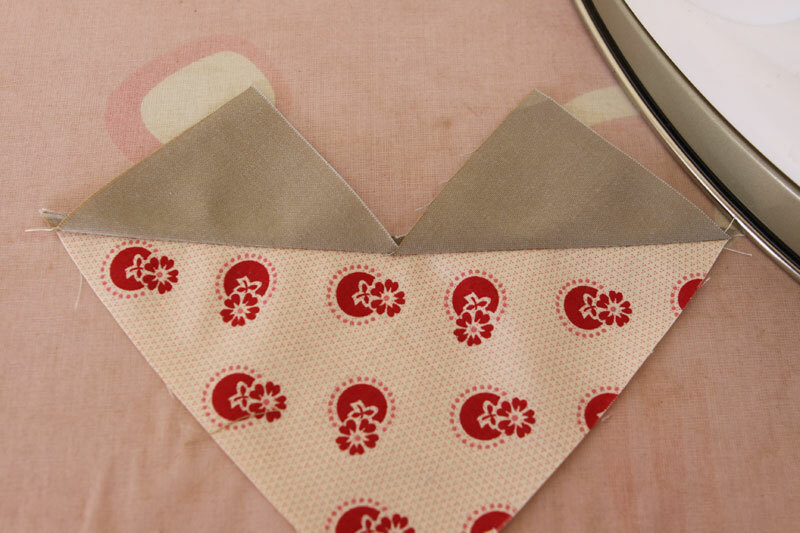 Such a great method for making Flying Geese! Thanks so much for sharing your tutorial, Christine! I will be giving this a try! :) Thanks for sharing. 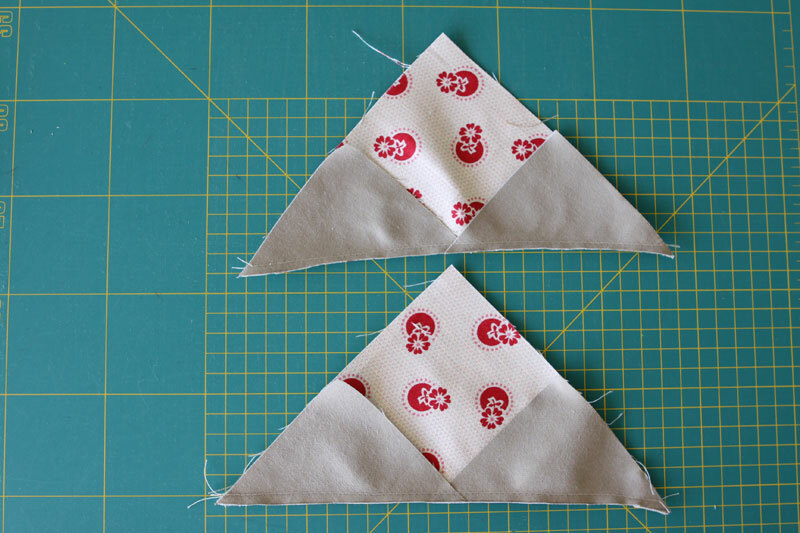 Hmm, I'm just thinking about this again, and I will be giving it a whirl, but was thinking that it may have irregular results if using directional fabric for the center square. I think I will make a few and find out what happens. Thanks again. I made a quilt with hundreds of flying geese, but I tried to make each one different. I like this method though. I am not sure I will be making flying geese again in the near future. I like the red print fabric. I love how you did this, super easy and you end up with 4 :) sweet. This approach is news to me -- thanks for sharing! Stopping by from Anything Goes Monday.. I need to work on this and practice. Thank you for a such good tutorial! 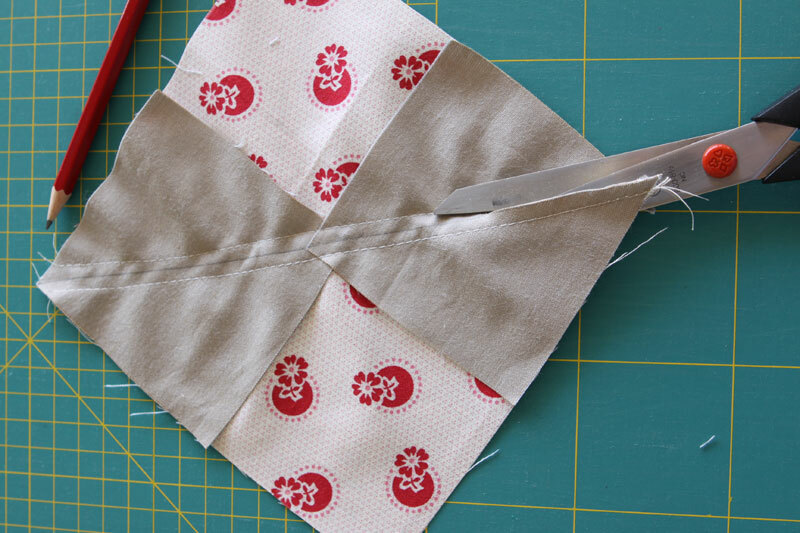 Sewing one baby quilt now. 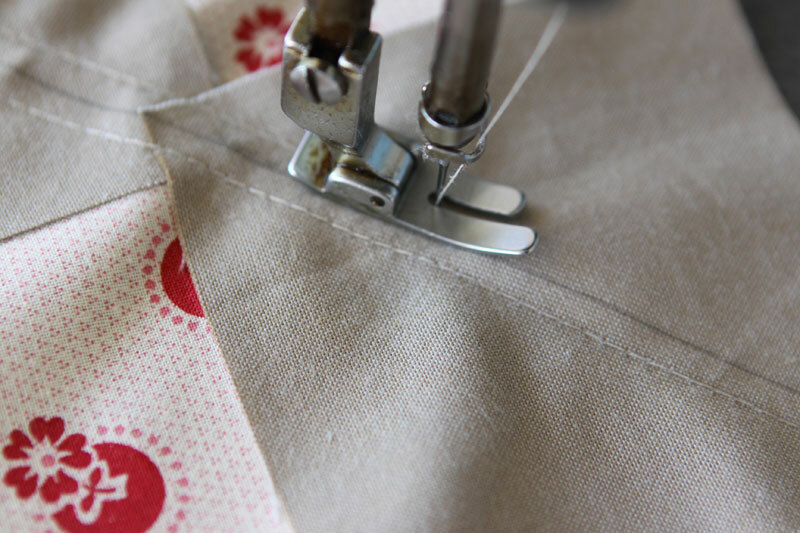 After joining do I iron seams upwards? I love this technique and I've tried to vary the sizes, but the math shown on the No-Waste Flying Geese formula never seems to come out right for me. Suggestions? I am so jealous of your home by the river, and that wisteria!!! Thank you for the tutorial, I've always wondered about this version. I'll have to try it out. Thanks for sharing.